Like many Middle-Eastern states, Abu Dhabi built its economy on oil production. However, it is almost unique in recognising that we must develop alternative energy models if we are to reduce the environmental impact of our contemporary lifestyles. 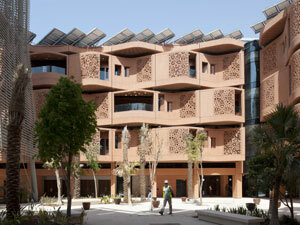 Masdar, the Abu Dhabi Future Energy Company, was established in April 2006 and is an organisation committed to advancing the development, commercialisation and deployment of renewable energy solutions and clean technologies, such as power generation from a range of renewable energy sources. 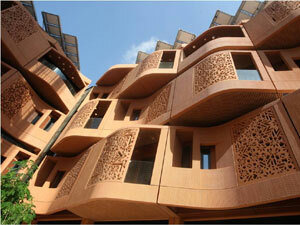 The new city of Masdar is the result of that initiative. Masdar City is liveable, sustainable and, now the first resident community are living and working at the Masdar Institute, the educational heart of the city is now operational. 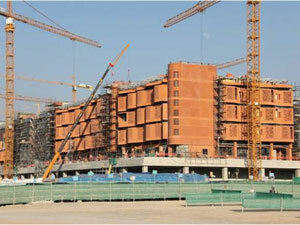 The city is anchored by its educational heart: the Masdar Institute. In collaboration with the Massachusetts Institute of Technology (MIT), the graduate-level, research-driven institution provides courses focused on education and research in advanced energy solutions, sustainable technologies and environmental policy. 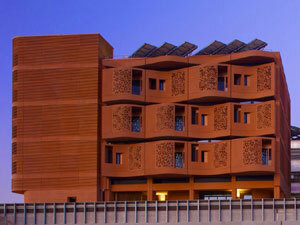 The first six buildings on its campus are now complete and occupied (2011), and the students and researchers are Masdar City’s first resident community. It provides the catalyst for the rest of the masterplan, which will continue to take shape as new phases start on site. It is within this larger sustainable context of the Masdar City Masterplan and the realisation in the first phase of the City, the Masdar Institute that the selection process led to the choice of GRC from GRCA Member CanBuild Group as a construction material. The main concept for the residential façades was to have a self-shading façade, designed to respond to their orientation, as well as shading the adjacent buildings and the street below. This was developed using a series of both physical and computational modelling techniques to help determine the eventual built form. The façades were designed as multiple layers, comprising an external balcony/screen layer, inner façade and insulation layer. External balconies provide excellent shading of the main residential envelope façade, while each layer provides a functional response to dealing with the harsh desert environment. The balcony spaces and vertical mashrabiya screens and shading devices form this first layer and were designed to provide excellent shading. Their curved forms provide directed oblique views down narrow streets, while maintaining privacy – the close proximity of the building facades, as specified in the Masdar City masterplan massing concepts, was the key challenge in this respect. 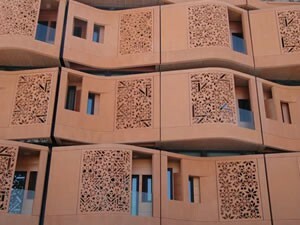 Jean-Marc Castera developed these screens specifically for the Masdar Institute through an understanding of the historical secular Arabic art of the past and the recent scientific research into mathematical geometry. Drawing on octagonal symmetry and avoiding monotony, the patterns were developed at different scales to allow the screens to have a degree of depth visually. The moulding possibilities of the GRC fabrication allowed for this to show through in the final installed elements, where the main areas of the GRC panels are typically only 25 to 30mm thick. The result was a contemporary reinterpretation of the mashrabiya screen, which protected the secondary inner layer, including windows. The colour scheme follows local traditions and other complementary materials combine with the GRC facades to create the whole balcony effect. Through discussions with the Client, the Main Contractor and the design team, the original scope was developed by CanBuild to create a fast-track solution for the facades to the Residential units in which several individual GRC panels were combined to create larger sized panels, thereby reducing the number of moulds and joints between panels. These larger GRC panels were then installed on to a steel frame, which was coated with corrosion and fire protection, off-site in our factory and delivered to site as ‘one-piece’ units utilizing 40ft open-top containers. One whole Residential balcony unit (two balcony units combine to form the external façade of one Residential unit) is then simply lifted and bolted on to pre-installed brackets which had been lined and leveled. Erection of these balcony units originally would have taken up to 10 days for each Residential unit but subsequently the GRC facade modules were fixed in place in only 2 hours. The deployment of state-of-the-art GRC materials and spraying techniques enabled the GRC to be produced with an optimum percentage of fibre in the mix, resulting in a reduction of its carbon footprint. As part of this process, even the materials and process used for moulding of the panels were assessed to ensure the lowest possible carbon footprint. 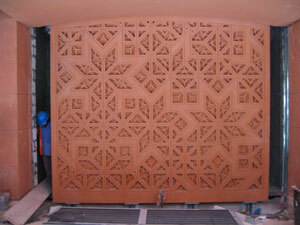 As an example of this, silicone was used as a liner to form the voids, to create the decorative pattern in the panels. The silicone was able to be re-cycled for use in other moulds. Flourosilane sealer was applied to the face of the GRC to provide a waterproof surface that also proved successful in reducing the unsightly visual effect of sand adhering to the facade after sand storms. The overall visual effect is a GRC façade that meets the client’s and the designers’ requirements, fixed in place to the optimum programme. These issues were fundamental in the approval process for the use of these GRC panels for this project. • Multiple layers of façade using GRC mashrabiya screens, solid and glazed elements act to minimise heat gain. • Curved forms provide directed oblique views in narrow streets while maintaining privacy. • Patterned GRC screens designed by Jean-Marc Castera provide privacy control. • Staggered undulated façade to provide self-shading from high sun. • Modular, with a limited number of types, so much assembly can be done offsite. Balconies can be lifted into place with all cladding installed on pre-assembled lightweight steel frames. • As screens increase in density, and size and number of façade window openings decrease, the more sun a façade receives. • Deep openings in inner-most façade reduce heat gain while creating dramatic lighting effects. Foster + Partners’ masterplan for Masdar City aims to establish the world’s first carbon neutral, zero waste desert community. It is rooted in a sense of place, shaped by the specific climate of Abu Dhabi. Its form is inspired by traditional desert settlements, which are compact and oriented so that the buildings provide shade and channel cooling air currents. The use of Glassfibre Reinforced Concrete (GRC) has helped in meeting this challenge with its inherent properties and in its manufacture, fabrication and physical attributes. At the 16th International Congress of the Glassfibre Reinforced Concrete Association (GRCA), held in September 2011 in Istanbul, Turkey, GRCA Member CanBuild Group, of Hong Kong, won a GRC2011 Award for the Masdar Institute project.